"Boom on a once enchanted place". 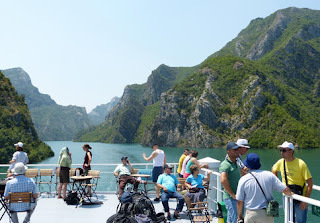 The beautiful of Northern Albania has captured the eye of a German journalist, Florian Sanktjohanser, who wrote a whole article published at online magazine “NWZ Online”. 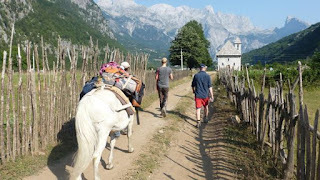 He describes the mountains of Northern Albania as a long been forgotten corner, poorer even than the rest of the run-down state. But now more tourists venture into the picturesque valleys. There it looks like in the Alps 200 years ago. During his journey he met local people and has unveiled their lifestyle in the villages. The top staggering places mentioned in the article are: the city of Shkodra, Thethi village, Valbona Valley and Lake Koman. "The foreigners are asking to buy "The tower of vendetta", known as “Kulla e Ngujimit’ who has guarded my family for 400 years. But I would not give up the tradition," says Sokol Nikolle Koçeku, the owner of this tower. The tower survived during the rule of the Ottomans and the Communists, and is one of the few such historic houses in Albania. Now I will not let this place to be sacrificed to the latest invasion: the onslaught of tourists. 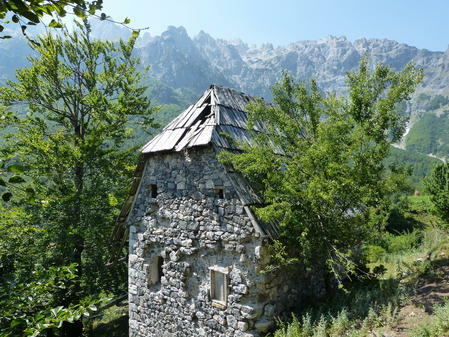 The Kulla is in Theth, a village in the "Cursed Mountains" in far north of Albania. It is a wild area where the Kanun, the tradition of common law governs life even in these days. The people here have been extremely poor for centuries. 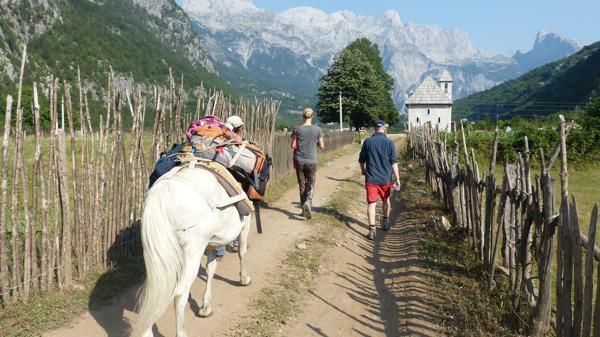 But now a small miracle happens: Since a few years, more and more tourists come walking in the Albanian Alps. And with them sweep the people,( who left the area for years), back to their villages. In the well-kept pedestrianized area, you can see young Westerners sit in cafes, walk to the fortress, or book their ferry for the next morning to Valbona Valley. For the fastest and most stunning way to the Valbona Valley leads over the Koman dam. Valbona Valley: Since 2007, the Valbona National Park is in guidebooks. Albanian television crews came and turned documentaries about the ancient traditions. Even more important was that the only road was pave into the valley. Since then, the number of day-trippers has increased rapidly. 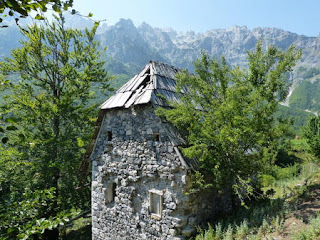 "Valbona has for many Albanians something mystical. In July and August rose at least 50 hikers per day up to the pass. And every year would more. Thethi Village: ‘I think no place where human beings live has given me such an impression of majestic isolation from the entire world. It is a spot where the centuries shrivel; the river might be the world’s well-spring, its banks the fit home of elemental instincts–passions that are red and rapid’, the English writer Edith Durham wrote in early 20th century about Theth. The "majestic" can continue to let them stand until almost 2700m, the craggy peaks on. At least the residents of Theth have preserved their traditional architecture. Most houses are built of stone and covered with shingles. And the church, destroyed during the atheistic republic, was restored thanks to wealthy Albanians in the diaspora.